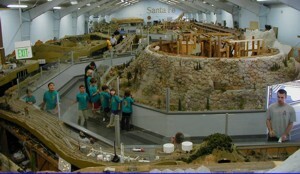 The Golden State Model Railroad Museum houses the three gigantic layouts (O, HO and N scale) built and operated by the East Bay Model Engineers Society. The three displays cover 10,000 square feet. Approximately seventy members contribute their time, money and skills to make these into some of the finest model railroads you'll ever see. Scenery and operations are representative of those seen throughout California. For example, the Tehachapi Loop area replicates prototype operations of the Southern Pacific and Santa Fe Railroads with long freight trains passing over themselves to gain elevation. We operate equipment ranging from the last great steam locomotives through to the most modern and powerful diesels pulling long freight and passenger trains.